One Brooklyn Bridge Park — Ed Kopel, Architect, P.C. 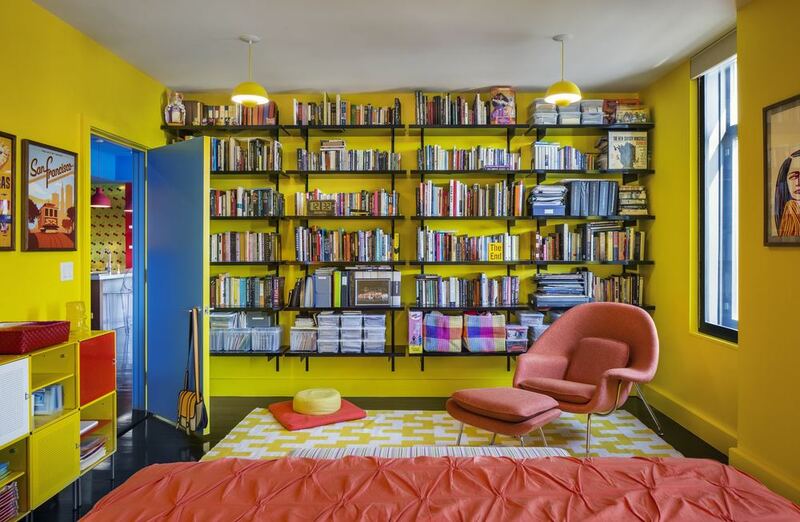 The basic charge of the project was to design several new bookcases to accommodate the owner’s vast library. The apartment is located in the first building constructed at Brooklyn Bridge Park. The apartment has majestic views of the lower Manhattan skyline. The owners, two accomplished Broadway artists – an Emmy award winning music producer and his husband a noted choreographer with his namesake dance company – were new to the building. 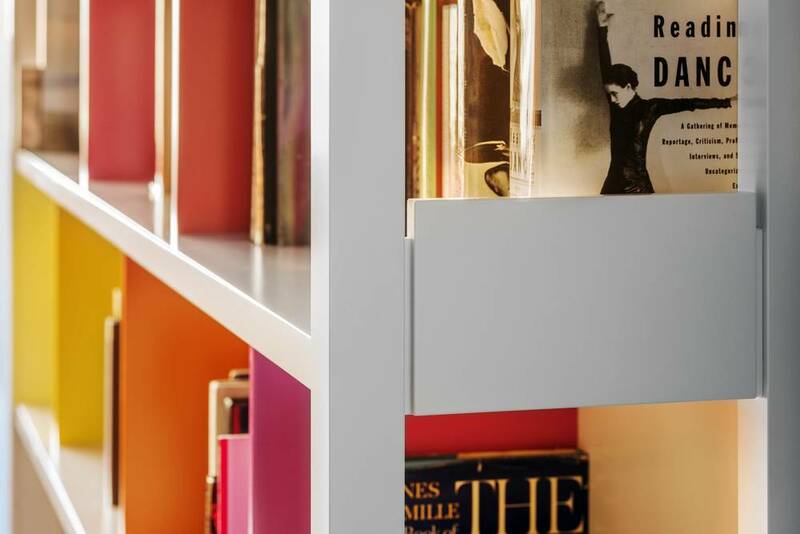 The bookcases were threaded throughout the apartment, affecting nearly every room and, in nearly every case, serving an ulterior motive – whether organizing adjacent spaces, directing a view or a path, or hiding a utility. 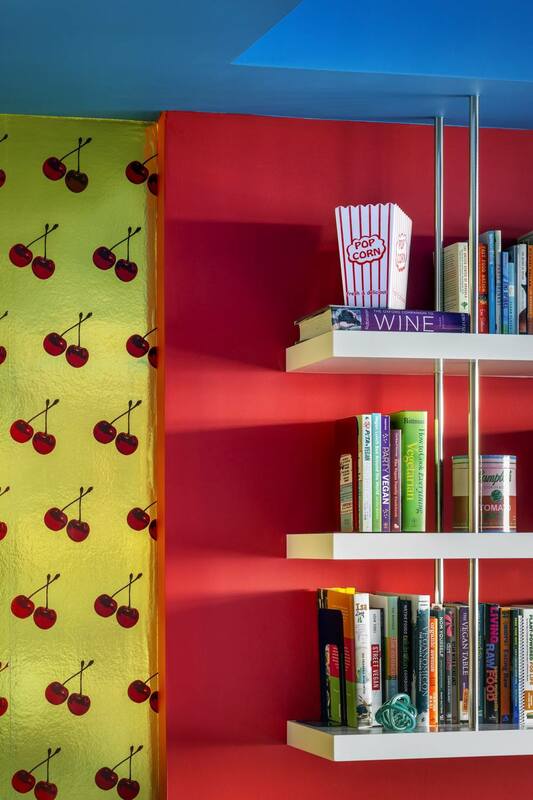 The bookcases also became an architectural canvas on which to convey the client’s love of vibrant Crayola colors. In an effort to create a neutral background for the oncoming color blast the entire floor was dyed black and coated with a glossy finish to reflect light. Similarly, a walk-in closet was painted black, to enhance the owner’s technicolor wardrobe. New architectural lighting and decorative lighting was installed. This project has been featured in the New York Magazine Design Newsletter, Design Hunting, and News 4 New York.